The Iodine Global Network is delighted to launch The Iodine Blog. Here, we bring you stories from the field, where our regional and national coordinators and partners are working on the frontlines of the global fight against iodine deficiency. Sign up here to receive The Iodine Blog as a regular e-mail. Two-thirds of all countries mandate food fortification to combat hidden hunger, yet many are not translating policy into improved nutrition, according to new data from the Global Fortification Data Exchange (GFDx). These countries may be missing an immense opportunity to improve the health of children and mothers. After years of intensive public health campaigning, a proposed bill would address iodine deficiency. In what would be a victory decades in the making, Russian lawmakers may enact a program to address the population's longstanding iodine deficiency with iodized salt. Iodized salt or sea salt: Which is better for you? Working in close collaboration, our organizations are tackling the problem of hidden hunger. We are improving the intake of key vitamins and minerals in the diet through food fortification. To re-evaluate and compare the iodine status with other countries, new studies were conducted in Macedonia in 2016–2018. Their results confirm the success of a national coalition against iodine deficiency disorders. Three students at the University of Surrey (UK) recently cooked up a storm with a new evidence-based cookbook of iodine rich recipes. We ask two of the student authors what inspired them to take on this project, and which recipes are their favourite. GFDx in Spanish is now launched! ¡El Intercambio Global de Datos de Fortificación se encuentra disponible en español! Estos datos se encuentran tanto en inglés como en castellano. In Benin, government leaders and nutrition experts held a gathering to raise awareness in the community for iodine deficiency disorders (IDD), as part of the 21st National Day of Mobilization for the Fight against IDD, on Saturday, October 27. Following the recent news that the UK will add folic acid to flour to prevent birth defects, we sent this urgent letter to the UK government via The Guardian, urging them to add iodine to salt. Tata Salt captured India’s attention when they rolled out the #MissingI campaign, taking the letter ‘I’ out of national headlines to create awareness of the importance of iodine for Global Iodine Deficiency Disorders Prevention Day on October 21st. Global Fortification Data Exchange (GFDx) holds a series of workshops in countries across Asia, Africa, and the Americas to apply empathy mapping and journey mapping to navigate data system transformation. Based on the first survey in Burundi in more than a decade, the salt iodization program is failing to impact women of reproductive age and protect newborns from mental impairment. Featuring a new data visualization from the Global Fortification Data Exchange (GFDx): Country Dashboards. Country Dashboards give a picture of the food fortification situation in each country, such as fortification of maize flour, rice, wheat flour, oil, and salt. Universal Salt Iodization now reaches 86% of the population in low and middle income countries, and is considered one of the most successful public health achievements in the past fifty years. And this could not have happened without our partners in the salt industry. Experts in iodine deficiency have released updated recommendations on monitoring national salt iodization programs that will guide iodine program managers toward better program monitoring, data interpretation, and sustained optimal iodine nutrition. On May 15, China celebrated the 25th National IDD Prevention Day. This year’s theme translates as “Sharing a bright and healthy life with iodine”. The aim of the day is to raise awareness of the role of iodized salt in IDD prevention. Last year, the Iodine Global Network collaborated on an anthology which brought together the realms of poetry and science. Following a successful launch, we’re catching up with the editor, Callan Waldron-Hall. Nine Caribbean countries are taking part in the Caribbean Island Urinary Iodine and Salt Survey (CRUISE for short) conducted by IGN with support from UNICEF and the Pan American Health Organization (PAHO). The recently published SIMPLIFY study shows that USI, when truly universal, provides sufficient iodine to meet the dietary requirements of pregnant and breastfeeding women, and weaning infants, with important implications. A meeting to launch the 'Kraków Declaration on Iodine' was held on Wednesday 18th April, 2018 at the Collegium Medicum, Jagiellonian University, Poland in a bid to encourage policymakers to address public health strategies to improve and secure adequate iodine status in the European population. Interested in a GFDx data workshop? Get in touch! The GFDx is seeking national decision-makers interested in attending in-country workshops to examine their fortification data collection systems and identify how fortification data can improve national programs. Workshops to be held in English and Spanish. Get in touch by April 8, 2018. The IGN and UNICEF have supported a survey of iodine status and iodized salt to find out if women are iodine deficient. The first national study of iodine nutrition in over a decade is currently coming to a successful conclusion in Burundi. The IGN is the proud winner of an annual ‘Giving Game’ hosted jointly by Giving What We Can and Students for Global Health at the University of Sheffield, UK. The IGN and UNICEF held a regional workshop on strengthening monitoring systems in countries of South-Eastern Europe and Central Asia on February 20, 2018. Georgia has sustained more than a decade of optimal iodine nutrition, based on exciting new results from a national survey of school-age children and pregnant women conducted by Georgia’s National Center for Disease Control and Public Health (NCDC). Sudan’s first salt iodization plant marks a milestone toward eliminating iodine deficiency. On February 7th, Sudan opened its first of three new salt iodization plants at the Shafie Factory, in Port-Sudan, Red Sea Province. Civil society organizations and the scientific community in Vietnam advocate for mandatory salt iodization and its use in processed food. National stakeholders in the Democratic People’s Republic of Korea (DPRK) devise a new strategy to eliminate IDD through the production of adequately iodized salt, with technical support from UNICEF and IGN. At the start of 2018, we remain on track toward the goal of eliminating iodine deficiency disorders (IDD) in all countries by 2020. When it finally happens, it will be an outcome of the collective inputs of many partners. At the Iodine Global Network, our core mandate is to harmonize and leverage their collective action. A global nutrition coalition will expand the Global Fortification Data Exchange (GFDx), an analysis and visualization tool that provides free access to data on food fortification to enable effective global nutrition policy and programs. In Eastern & Southern Africa, countries are putting national nutrition on the agenda as an investment in economic prosperity. Universal Salt Iodization is in the vanguard. Across the diverse salt industry of Tanzania, transformation is now underway to help improve the salt supply and assure that salt contains adequate iodine. The medical and public health community of Armenia has new cause to celebrate. Recent research findings showed that, thanks to Universal Salt Iodization (USI), Armenia is protected from iodine deficiency disorders (IDD), a leading cause of cognitive impairment in newborns. On September 9, 2017, the Iodine Global Network, EUthyroid, and the European Thyroid Association (ETA) co-hosted a symposium dedicated to iodine nutrition in Europe, as part of the annual ETA meeting, in Belgrade, Serbia. The meeting was hosted by John Lazarus (Cardiff University and IGN Regional Coordinator for Western and Central Europe), and it featured iodine experts from across the continent. A new study in the UK found concentration levels of iodine in non-dairy milks to be only 2% of levels found in cows’ milk. Researchers measured iodine content in seven milk alternative drinks: soya, almond, coconut, oat, rice, hazelnut and hemp, finding an average of only 2 micrograms (mcg) of iodine per serving. The IGN is delighted to announce the launch of the Global Fortification Data Exchange (GFDx), a new online analysis and visualization tool for food fortification data, created in collaboration with FFI, GAIN and Micronutrient Forum. The Iodine Global Network is working with key partners to raise the alarm to authorities and international humanitarian organizations to urgently accelerate the salt iodization program. Following a nationwide public health campaign, iodine nutrition in Russia has been on the lips of the media, public health experts and the decision makers. At a high-level inter-agency meeting on June 21, a draft amendment was discussed to the current Federal Law. 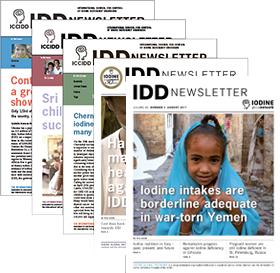 The Iodine Global Network mourns the loss of Dr Basil Hetzel, world-renowned epidemiologist, and founding father of the International Council for the Control of Iodine Deficiency Disorders (ICCIDD, now the Iodine Global Network), whose pioneering work on iodine deficiency has helped to save millions of lives. The Swiss, Russian-born model and enterpreneur Xenia Tchoumitcheva (@xenia) has launched a two-week fundraising campaign for the IGN via the All Charities UK online platform. The conference was co-organised by the Chinese Medical Association (Endemic Disease Branch and Endocrinology Branch), the Chinese Nutrition Society, and the China National Salt Industry, and supported by China’s National Health and Family Planning Commission, the Iodine Global Network, WHO and UNICEF. On October 13-14, 2016, in Sarajevo, Bosnia and Herzegovina, IGN and UNICEF held a consultative workshop for multi-sector country teams from the western part of the UNICEF CEE/CIS Region, entitled Sustainable Prevention of Iodine Deficiency and Achievement of Optimal Iodine Nutrition. On October 6, 2016, an All-Russian campaign was launched on the prevention of iodine deficiency disorders entitled "Salt + Iodine = Saving IQ" at the national Endocrinology Research Center, under the auspices of the Ministry of Health, with the IGN's support. On Saturday 3rd September, the Iodine Global Network (Western and Central Europe) and EUthyroid held a joint satellite meeting in Copenhagen, Denmark, organized as a pre-conference event of the 39th annual meeting of the European Thyroid Association (ETA). The theme was harmonisation of iodine nutrition in Europe. On 17 March 2016, the Iodine Global Network held a Symposium on Iodine and Pregnancy for health professionals, at the Royal College of Obstetricians and Gynaecologists, London, UK. In October, the Iodine Global Network held a Regional Workshop on “Achieving universal salt iodization for optimal iodine nutrition” in Bangkok, Thailand. The three-day event was organized jointly with our partners: UNICEF, Global Alliance for Improved Nutrition (GAIN), and Micronutrient Initiative (MI), and in collaboration with the Thai Ministry of Public Heath. On September 24-25, 2015, the IGN and UNICEF held a consultative workshop for countries in the CEE/CIS (Central and Eastern Europe/ Commonwealth of Independent States) Region on "Sustainable prevention of iodine deficiency and achievement of optimal iodine nutrition" in Almaty, Kazakhstan.